"The question became: what do you do with them?" 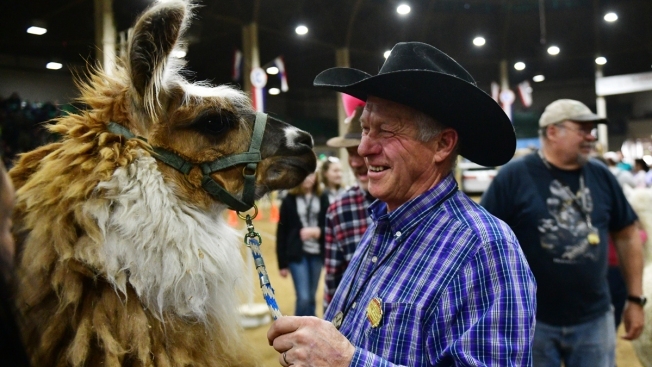 This Jan. 12, 2019, file photo, shows Dwayne Flinn of Casper, Wyo, at the National Western Stock Show with his four-year-old llama Mischief. The number of llamas in the United States has cratered, dropping from nearly 145,000 in 2002 to fewer than 40,000, according to Department of Agriculture census data. Farmers, auctioneers and experts told NBC News that the llama market quietly crashed after people realized that the uses for the animal native to South America, like providing fiber, working as pack animals or guarding sheep, aren't particularly lucrative. "Once the industry got beyond the novelty and breeding aspects, the question became: what do you do with them?" said llama and alpaca expert Robert Van Saun, a professor of veterinary science at Penn State University. After years of growth in llama prices, the bubble burst soon after the crash of the real estate market in 2007, leading many farms to abandon llama raising entirely.